An attempt to explain the Israeli prime minister's strategies that many continue to dismiss dangerous and irresponsible. Note: This column was written BEFORE Friday's bombing. http://www.JewishWorldReview.com | Last Sunday Israel crossed two Rubicons. The Cabinet decided once and for all to withdraw from Gaza and dismantle 25 settlements  21 in Gaza and four in the upper West Bank. Yet, had Israel done only this, it would be seen, correctly, as a victory for terrorism, a unilateral retreat and surrender to the four-year intifada. That is why the second Israeli decision was so important. The Cabinet also voted to finish the security fence on the West Bank, which will separate Israeli and Palestinian populations and create the initial border between Israel and a nascent Palestine. The fence decision makes clear that the unilateral withdrawal from Gaza is only part of a larger strategy, the first serious strategic idea Israel has had since its period of utter confusion and demoralization at the beginning of the 2000 intifada. The idea is this: Israel must (unilaterally, if necessary) rationalize its defensive lines  in order to (1) protect its citizens, (2) permanently defuse the Palestinian terrorist threat and thus (3) open the door to a final peace. Evacuating Gaza and completing the fence are complementary parts of that strategy. Both Gaza and the northern West Bank are separated from Israel by fences. Not a single suicide bomber has infiltrated through them. As a result, northern Israel enjoys calm. But in Gaza, which is also surrounded by a fence, the bloodshed has continued. Why? Because 8,200 Jews are living on the wrong side of the fence. Defending them involves enormous Israeli military deployments, great danger and no real return. Everyone knows that ultimately this island of Jews in a sea of a million Arabs will have to go. Once Israel leaves Gaza, and once the rest of the West Bank fence is completed, the Israeli and Palestinian populations will be almost perfectly divided in their own territories as defined by this temporary frontier. The fence approved by the Cabinet last Sunday leaves perhaps 1 percent of Israelis on the wrong (Palestinian) side of the fence and perhaps 0.4 percent of Palestinians on the wrong (Israeli) side of the fence. (These figures exclude polyglot Jerusalem.) This defensive barrier separating the two populations will not only prevent suicide bombers from killing hundreds of innocent civilians. It will change the entire strategic equation of the Israeli-Palestinian conflict. The terrorism weapon that the Palestinians have brandished in the past  and will surely brandish again at every turn in negotiations when their maximal demands go unmet  will disappear. Sure, there could be random attacks. But that is true of Spain and Indonesia and much of the world today. What changes with the Gaza withdrawal and the fence is that terrorism as a reliable weapon, a constant threat, a strategic asset, ceases to exist. And once that option is removed, the Palestinians will in time be forced to the collective conclusion that the world has been awaiting for 57 years  that they cannot drive the Jews into the sea and must therefore negotiate a compromise for a permanent peace. That day may not come immediately. The beauty of the withdrawal and fence plan is that, in the interim, it creates a stable status quo with a minimal level of violence. In that interim, Israel can live in peace, and the Palestinians can develop the institutions of their state and begin to contemplate a final end to the conflict. 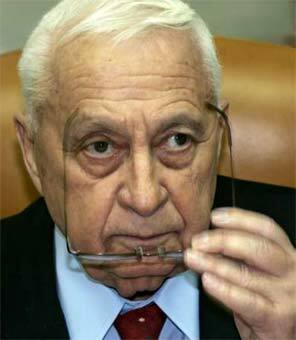 Why did Ariel Sharon do this? Did the father of the settlement movement go soft? Defeatist? No. The Israeli right has grown up and given up the false dream of Greater Israel, encompassing the Palestinian territories. And the Israeli left has grown up too, being mugged by the intifada into understanding that you do not trust the lives of your children to the word of an enemy bent on your destruction. For now, you trust only the defensive fence and the deterrent power of the Israeli army. Sharon is no dreamer like Yitzhak Rabin and Shimon Peres, who bargained away land for a piece of paper. Sharon, like any good general  and he was a great general  is giving up land for a stable defensive line. Everyone wants peace, but Sharon's real obsession is terrorism. From his days as a young commando in the 1950s, he has been a fanatic about fighting terrorism. Take away the terror weapon and everything else follows: safety, stability and the conditions for a final peace. A peace based not on the good will of a Sharon or a Mahmoud Abbas but on the new reality on the ground: separate nations delineated by a temporary barrier to produce a temporary peace  and the possibility of a final one.